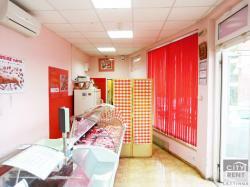 A commercial property for rent locate in a communicative area in Buzludzha district. The area of the commercial property extends to 35 sq.m. and includes a commercial space and a toilet. The estate is in very good condition. It benefits from aluminum window frames and doors, tiled floorings and latex -painted walls, there is an outside insulation as well. It is offered for rent unfurnished. The property has security system. It is set on the ground floor of a newly-built building near other commercial properties. The estate is suitable for both shop and office. The property is a great business investment. Buzludja district is a well-organized one, offering all the needed amenities including schools, kindergartens, there is regular public transport to all parts of the town. Asking rental price does not include VAT. „Buzludja” is a neighborhood area in Veliko Tarnovo, located in the southwestern part of it. The old name of the neighborhood is Pishmana, near the industrial zone. In the region is dominating panel construction, but in the last several years it has been invested in new, as well. The district has all the necessary amenities - schools, shops, supermarkets, nurseries, restaurants, bus stops. The territory of the neighborhood has a nursing home, supermarkets Billa, Lidl, children and adolescent department of the library “P.R. Slaveykov” and a post office. There are over 30 000 people in the square Buzludja with so-called Zone B area. In the past both of them used to be one neighbourhood with the name of Pishmana.